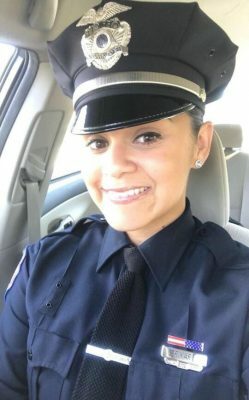 Like thousands of students who become part of the Orange community each year, Syracuse University became the fulfillment of a dream for Liztazia Ramirez, who joined the Department of Public Safety (DPS) last year as an officer and quickly impressed her colleagues with her ability to resolve conflicts and build relationships with students. How did your upbringing affect your choice of career? My Mom was my inspiration. She was a parole officer for about 10 years. She transitioned to the Office of Special Investigation as an Investigator and just recently was appointed to assistant deputy superintendent at Albion Correctional Facility. To be able to achieve all of that while being the youngest of 12 siblings, yet the first to graduate from college with a bachelor’s degree, and a single mom who raised my brother and me, made me want to follow in her footsteps. It is because of my mom that I have always known that I wanted to work in the law enforcement field. When I graduated from the Department of Public Safety Academy at Syracuse University, my mother pinned my badge on me. It was such an honor. The training isn’t a breeze, and I would call her all the time throughout the academy. And she would always uplift me and tell me to hang in there. I know she was so proud of me. That made me extremely happy. 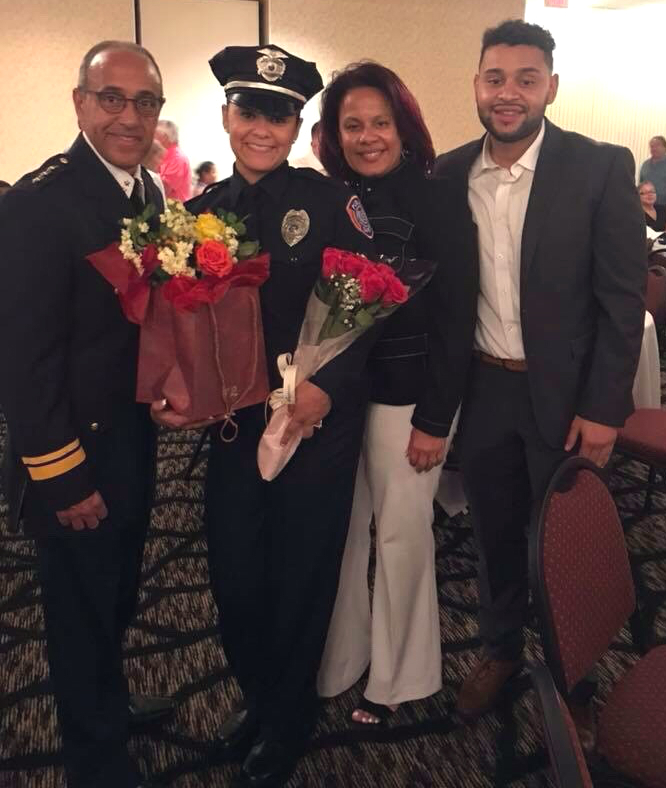 Department of Public Safety Chief Bobby Maldonado; Officer Liztazia Ramirez; her mom, Elizabeth Maldonado (no relation to Chief Maldonado); and Ramirez’s brother, Carlos Colon, at the Department of Public Safety Academy graduation. How did your work at a juvenile correctional facility shape the way you approach your work here? I was a juvenile corrections officer at the MacCormick Secure Center in Brooktondale, New York, before I became an officer here. Part of my job was to supervise and assist incarcerated youth, helping them develop some positive habits towards work and study. I also helped them build and maintain healthy communications and relationships between them and their families. I had an opportunity to use my training in conflict resolution, which comes in handy on this campus. To do the job of a public safety officer well, you need patience, thick skin, understanding and compassion. No one in life is perfect. Although some choices people make can be hard to come back from, I learned that no matter who you are dealing with, you must treat people with dignity and respect. I will always be grateful for that. How tough was it to transition to a university environment? This was one of the easiest transitions for me. The choice of taking this position was easy because I find this to be a healthy and less toxic environment. Because I come from a different environment, I believe I bring a fresh perspective, which allows me to strike a balance between policing students on campus and community members. The possibilities are endless here. There is so much room for growth. I think anything you do in life will have challenges. Just knowing my status as a campus law enforcement officer is challenging in itself. Knowing that the choices I make on every call will be scrutinized because of my status. I understand the stigma between law enforcement and the community. If I can come to work every day and work hard to develop a healthy relationship between law enforcement and the community we serve, I will feel fulfilled. What inspires you about your job here? I have realized the level of independence I have on this job, as opposed to my previous positions. Also, the moment I realized I was in the right place was fortified by students being appreciative of me taking an extra step and my supervisors and administration team being supportive and commending me for the work I have done. That is not something that you see all the time in the workplace. I am inspired by the goals of my job: to continue to build a positive relationship between the community we serve and us as public safety and law enforcers. We play a bigger role than “just officers.” We are protectors, counselors and mentors. And what inspires you outside of your work here? I have been a volunteer mentor at the Good Life Philanthropic Youth Foundation, which is dedicated to improving the quality of life for at-risk youth to encourage them to escape poverty, excel at school and to pursue productive careers, perhaps as entrepreneurs. In fact, my fiancé founded the organization, and his work and dedication are so inspiring to me. He had a vision, funded it from his own personal commitment, and in the last five years it has flourished into one of the leading youth service solutions in the state. His vision is finally coming to fruition. The type of work that he does with at-risk youth in this community is so astonishing. The best thing is that the organization produces amazing results. Not everyone can do what he does. It really is God’s work. There are a lot of pressures on public safety officers. How do you deal with the stress? When it comes to the stress of the job, I surround myself with positive people and don’t take things personally. I remain true to myself and never compromise who I am.